Elia Kazan’s 1963 saga, America America, will be released on DVD today, February 8th. Though it had previously been available in a box set of the director’s work, this is the film’s debut as a DVD single, courtesy of Warner Home Video. In the late 19th century, a young Greek man, Stavros (Stathis Giallelis), and his family are living in a poor Turkish village. Wanting a better life for all, Stavros’ father sends his son to Constantinople (which would be named Istanbul years later), with the hope that Stavros will earn enough money to send for the rest of his family. Stavros, a compassionate man who gives his shoes to a peasant (Gregory Rozakis), is soon burdened by hardships in the course of his arduous journey. By the time he reaches the shop run by his father’s cousin, he has lost his family’s fortune and nearly all of his possessions. 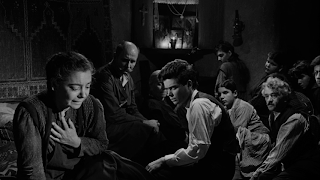 Though Stavros initially rejects the cousin’s idea of marrying the daughter (Linda Marsh) of a wealthy man (Paul Mann), the adversities of living on the streets leave him a desperate man. Nothing, however, can deter Stavros from his dream of living in America. One of the most rewarding qualities of America America is that much of the story is told not with characters or dialogue, but with the camera. 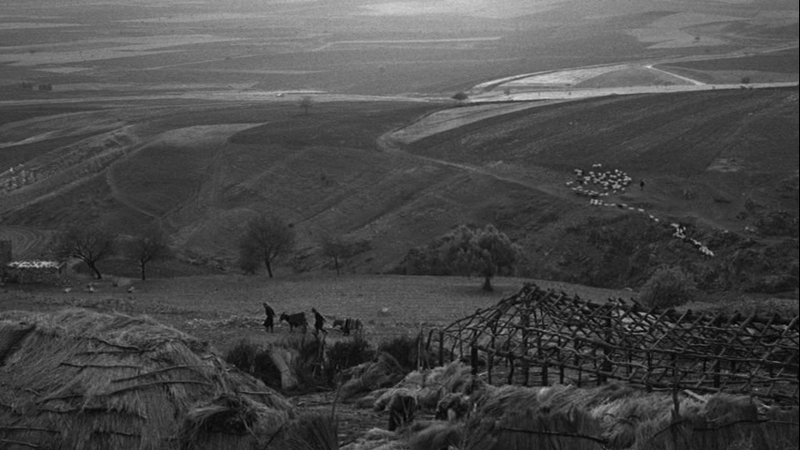 With Stavros’ village in a mountainous region, Kazan often frames the characters in long shots. As a consequence, Stavros, particularly in the film’s beginning, seems small against the massive backdrop. Even in Constantinople, he’s a meek character overshadowed by gigantic boats at the port and easily absorbed by huge crowds. It’s a visual component to express that his desire to make it to America is a seemingly impossible feat. As the film progresses, however, Stavros regularly appears inside smaller places, like rooms and restaurants. 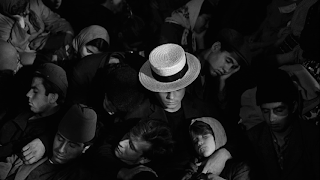 Later in the movie, Stavros, cramped among passengers aboard a ship, stands out in his straw hat, an adornment he has deemed American. Kazan, who also produced and wrote the screenplay, based the story on his uncle’s life. The director introduces and closes the film with a voice-over. He filmed the movie in Greece and Turkey with a largely unknown cast. Though leading man Giallelis had no previous acting experience, his performance is both natural and sympathetic. The remainder of the cast is equally good, particularly Marsh and Rozakis. The film earned Academy Award nominations for Best Picture, Best Director, and Best Screenplay (written directly for the screen, although Kazan had published a book of the same name in 1962). Gene Callahan won an Oscar for Best Art Direction (black-and-white) -- he was also nominated the same year for Art Direction (color), with Lyle Wheeler, for Otto Preminger’s The Cardinal. Kazan and Giallelis both won a Golden Globe (Director and New Star Of The Year), as well as nominations for Marsh, Mann, Rozakis, Giallelis (for Actor/Drama), and the film for Best Picture/Drama and the now defunct category of Promoting International Understanding (retired the same year that America America was nominated). 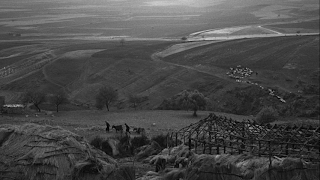 The Warner Bros. DVD presents a worthy transfer, the resplendent black-and-white photography pronounced in the anamorphic presentation. The DVD’s sole feature is a superb and highly informative commentary from film historian Foster Hirsch, who considers America America Kazan’s “greatest achievement.” The film is indeed an achievement, an account of a man who, in spite of oppression and tribulations, never retreats. The title is derived from Stavros’ time living on the streets, as the men would call out, “America, America,” when there was a heavy load that no other man would carry. Stavros suffers the burden for his family, but his letters back home are not grievances. He offers his family words of encouragement, so that they will hold onto what Stavros refuses to let die: hope. Warner Bros. provided a copy of this DVD for review. You can read about this release and other titles on the company’s website. Sark, I have not seen AMERICA, AMERICA--but have now added it to my list of "gotta-see movies." If Kazan's film is half as engrossing as your review, then it will be a rewarding viewing experience. It's also high praise that at least one critic considers this film Kazan's greatest achievement...I thought ON THE WATERFRONT was pretty good! Kazan was skilled at capturing the nuances of everyday life and it sounds like those details are on display in AMERICA, AMERICA, too. Am looking forward to watching for Kazan's use of framing as you described. Nicely written post. I have been waiting for years to see this. The recent documentary "Letter to Elia" by Martin Scorsese had nothing but praise for this movie (and some most intriguing clips.) It will be shown on TCM in April and you can bet I'll be watching. Sark, I love Elia Kazan's movies -- he has a focus on life and art that really speaks to me. I have not seen America, America, and from the sound of your excellent review, that's something I need to do. Excellent review. Sark, you have painted a touching portrait of this work of Kazan. The timing of this seems quite apropos for us today. We have wonderful blessings here in America that we often take for granted. This is what I've gleaned from your take on "America America." Thanks for your well-crafted review and the gentle reminder of the hope we have, as Stavros found. Such a thorough and beautifully written review! One that made me add another great film to my must see list. Excellent review, Sark, and I have to say I have never seen this movie. You make it sound so interesting. It is so nice to hear about a movie centered around people's lives and their families instead of just the action, silly comedy movies of today. I would certainly like to see this one. I enjoyed reading your review very much!! Sark, I remember watching this film and thinking what a tribute this film was to Kazan's family. The film can be very emotional at times. I'm glad it is finally coming out of DVD--now people will have an opportunity to see one of his finest films. When Men "Were Men as Men Should Be"